Well I went to two movies. Rather like going from the sublime to the ridiculous. Not in a bad way but two totally different types of movies. The first was "Bridge of Spies" directed by Steven Spielberg. Excellent movie. It has all the makings of an Oscar winner. Great actors, director and writers. Tom Hanks, Amy Ryan, Mark Rylance and Alan Alda turn in some of the best performances I have seen in a long time in one movie. It tells the story from the early 1960's of the discovery of the spy, Rudolph Abel and the negotiations for exchanging him for the pilot of a spy plane, Francis Gary Powers. Tom Hanks plays the part of the lawyer/negotiator, Jim Donovan. Even though I remember this for real, I was young and now I want to read up on it. So please go. Enjoy. Eat popcorn. 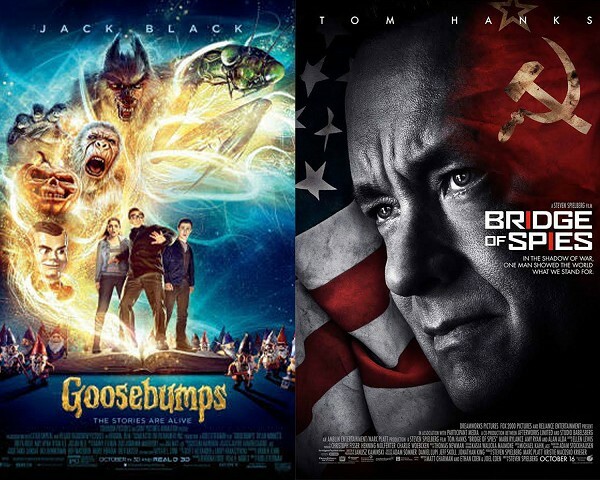 The second movie was "Goosebumps". It's based on a series of young adult's books written by R.L. Stine. My son loved them. To be a good mom I read most of them. They were spooky, campy and fun. So is the movie. Jack Black plays the mysterious neighbor of Zachary, played by Dylan Minnette, and his mom played by Amy Ryan again. Her acting wasn't as good here as in the first movie. I believe it was the difference in directors. I really enjoyed this movie. It pulled the books and old television show together with great special effects. It was fun! You don't have to bring a kid along in case you might look out-of-place. I don't think I'd bring very young children. Too scary for them. Adults, or pretend adults, can really enjoy it. I did.